Find inner peace and natural healing through the use of the InfraMat™ Knee-4T. This mat is state-of-the-art and created specifically for knee therapy use. The InfraMat™ Knee-4T is a knee wrap designed to be used directly on the knee for optimal knee therapy. The design of this mat is not only rare, but it is also completely unique. 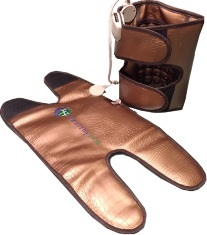 This knee therapy mat contains the healthy healing stone tourmaline. Specifically, the mat includes 35 tourmaline stones, and each stone is one inch stamped. The InfraMat™ Knee-4T’s use of healing stones creates a relaxing therapeutic experience. Combining the use of healing stones with heat therapy promotes overall wellness and a positive effect. The tourmaline stone promotes healing in its own specific ways. In addition to the many health benefits, this mat allows the user to have complete control over the heat settings. The heat on this mat is controlled with a modern LED control display. The heat will penetrate deep into the muscles and tissues to promote healing and relaxation as well as increase circulation of blood. The use of heat, combined with the healing stones, relieves stress, flushes the body of toxins, and promotes feelings of calm. The recommended setting for knee therapy is medium heat. If using maximum heat, it is recommended that the user place towels between the stones and the knee thus avoiding direct contact with hot stones. The InfraMat™ Knee-4T, as well as all InfraMat™ products, produce a high output of negative ions. The high output of negative ions provide a positive benefit for the body, as they encourage various positive biochemical reactions, which counteract free radicals, boost cellular metabolism, promote normal function of the nervous system, and increase or maintain overall physical health. The tourmaline stones also promote mental health, decreasing feelings of anxiety and alleviating feelings of depression. The InfraMat™ Knee-4T is a mat to be used specifically on the knees. This mat is sold as a set of two wrap pads that are connected with a wire. The mat measures 66 by 32 centimeters and consequently provides an excellent fit for use on the knees. The InfraMat™ Knee-4T weighs just 2 kilograms, making it convenient and lightweight. Not only will the mat store quickly and easily, but the compact nature of this mat also makes it an ideal travel companion. See yourself being able to carry health and comfort with you when you travel! Do not let pain or discomfort control your life any longer! This mat was designed with your comfort and health in mind. Order the InfraMat™ Knee-4T mat and experience its healing benefits. Take control of your life.